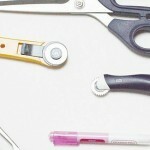 Today’s guest post is brought to you by our friend Katie from Running with a Glue Gun! 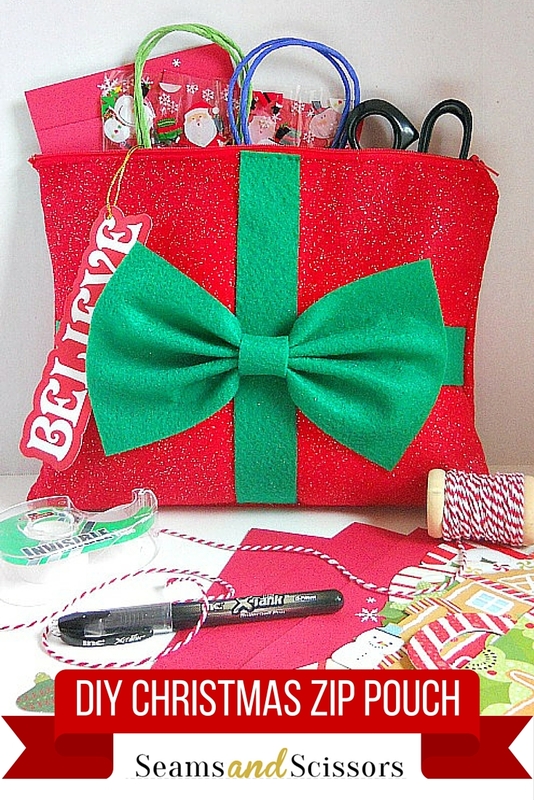 She’s showing us how to sew a zipper to create this adorable Christmas-inspired pouch for all of your holiday storage needs. Since Christmas is upon us, it’s that time of year where wrapping gifts (whether we like it or not) becomes an intricate part of our Christmas to-do list. It’s also that time of year where our scissors, tape, gift tags, and bows seem to sprout legs and runaway! You can never seem to find them when you’re really need them! To solve this problem, I came up with a cute Christmas Inspired Zipper Pouch which you can use to store all of those items in one place! 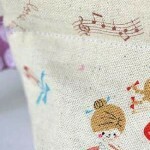 On the sewing side of things, this project is great for beginners who have never really sewed a pouch or zipper before. The pouch itself is made out of felt and is very inexpensive to make. 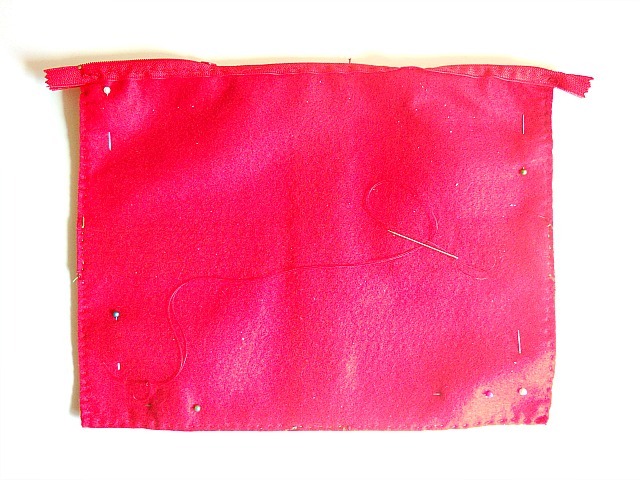 If you’ve never sewed a pouch or zipper before, then this project is definitely for you! I promise that this zipper pouch is super easy to make and you could easily make your own over the weekend! 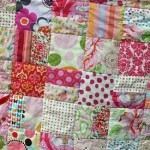 For this project I opted to sew everything by hand but you don’t have to. 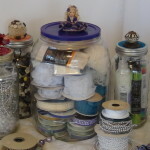 If you feel more comfortable using your sewing machine, by all means, sew away. Also the size of this pouch (when completed) will be a bit smaller than your normal standard size piece of felt (which is 12 inches by 9 inches). My zipper pouch ended up being about 11 ½ inches by 8 ½ inches. 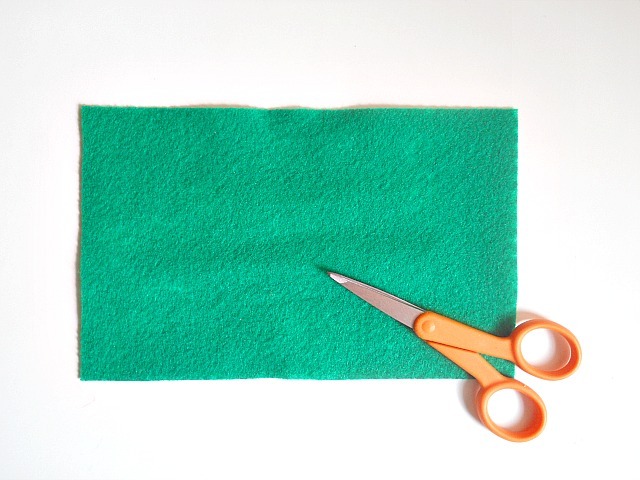 Step 1: Cut out two pieces of your green felt which measures 2 inches across. Then glue down each of your pieces (in a cross pattern) onto your larger piece of red felt. When you’re happy with the look, set it aside to dry. Step 2: Grab your two pieces of red felt and your zipper. First lay your two pieces of red felt, right-side down, with some space in-between them. Then place your zipper (again right-side down) in the middle of your two pieces of felt. Now pin your zipper into place and begin sewing. 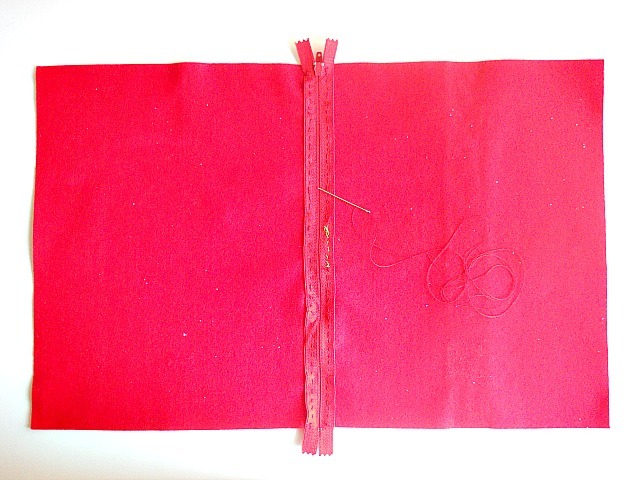 Step 3: When your zipper has been sewed, unzip the zipper just a little bit and pin your felt (right-sides) together. 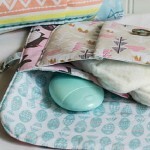 Once your felt is pinned together, sew around all three sides of your pouch. As a side note, if you are sewing by hand you may have to switch threads at some point while sewing. 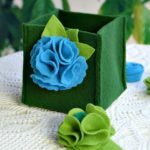 For example, I used red thread when sewing, but when I got to where my green felt was showing, I switch to green thread. When you have sewed around all three sides, flip your pouch right-side out. Step 4: Now it’s time to make your felt bow! First cut a piece of green felt that is 7 ½ inches by 5 inches. Step 5: Using your hot glue gun, pinch your felt in the middle and apply glue to the folds of your felt bow. 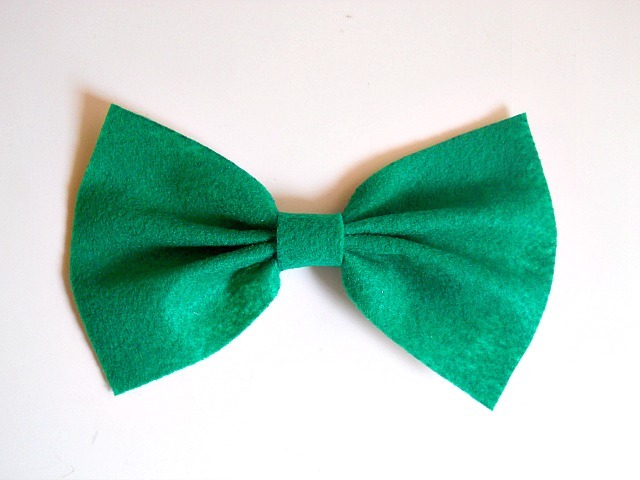 Step 6: Cut a strip of green felt that measures 1 inch across and wrap it around your felt bow. 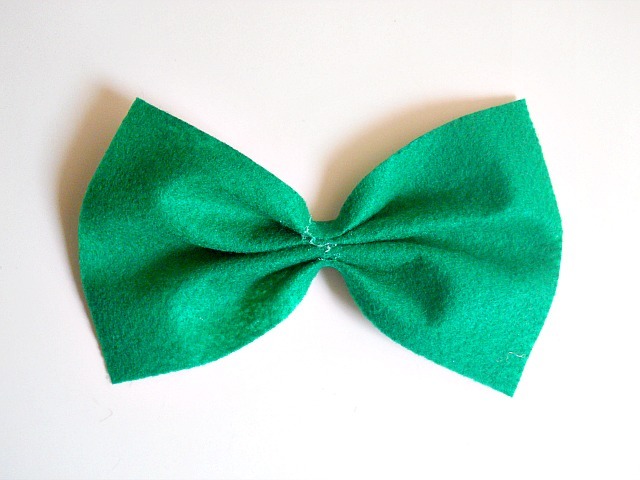 Once you’re happy with how your felt bow looks, glue that strip of green felt into place. 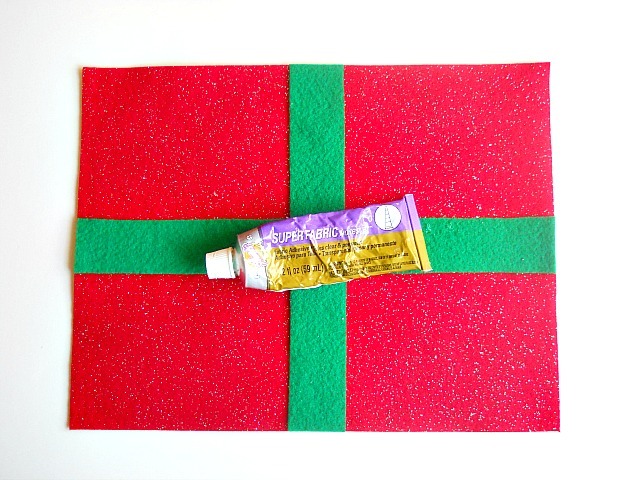 Step 7: Glue your felt bow in the middle of your felt pouch either using your fabric glue or hot glue gun. 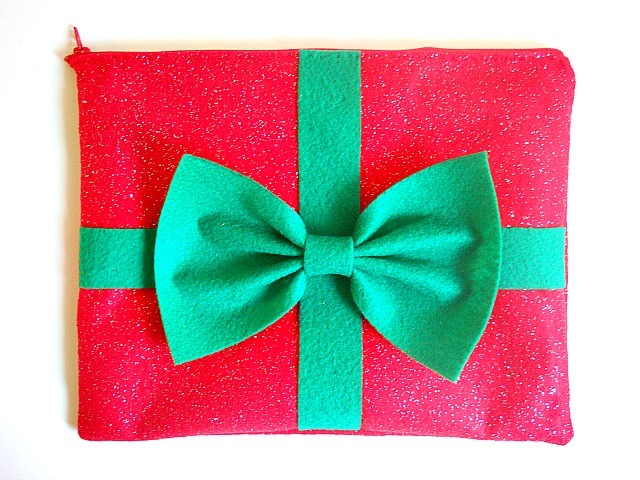 When your bow is glued onto your felt pouch, then you’re done! 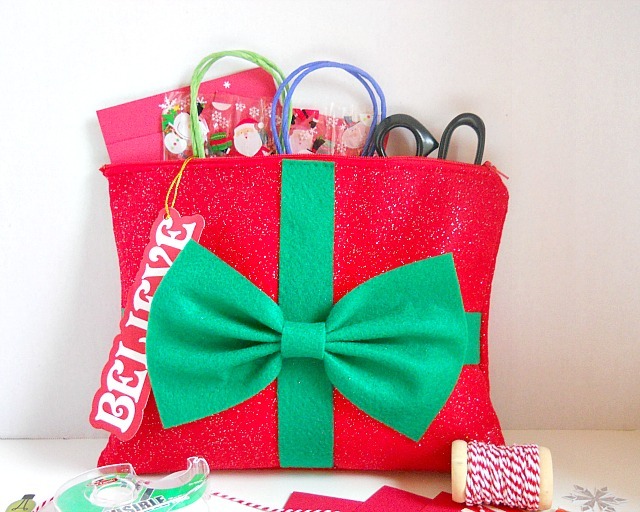 Now I’m using my Christmas Inspired Zipper Pouch to store all my holiday wrapping supplies, but you could use your zipper pouch to store items like Christmas cards. 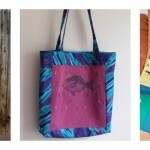 You can also use this DIY as a guide to create other zipper pouches which could be given as gifts. For example, you could change the colors of the felt, remove the bow and add some other type of embellishment to have a more everyday zipper pouch! If you made this zipper pouch, what would you use it for? I would use the new metallic quilted fabric with a metallic ribbon for ribbon and bow. Another darling DIY project! I love it, Katie! You have me so anxious to try out the super cute felt bows! 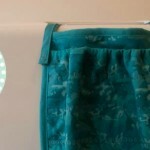 Sewing Tips and Tricks Tuesday: Roll or fold your fabric stash.